SunSetter Products are some of the highest quality items on the market today. SunSetter Retractable Awnings are the only awnings to receive the Good Housekeeping Seal of Approval. Choose from SunSetter's wide selection of Manual Awnings, Motorized Awnings, and the best selling SunSetter Pro Awning. 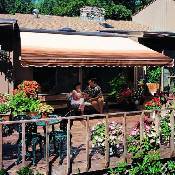 Retractable Awnings from SunSetter� transform your deck or patio into a beautiful semi-permanent outdoor room. 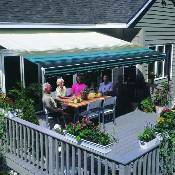 Awnings keep your family and patio furniture cool and protected from hot sun, showers, or harmful UV rays far better than an unstable umbrella or other traditional shade device. When you wish to enjoy the sun�s warmth, the awning can be retracted against your house in less than a minute. In addition to SunSetter Awnings, we are also proud to offer EasyShade Window Shades by SunSetter. The SunSetter EasyShade is a quality outdoor shade that looks as good as it works! It is the perfect solution when you want privacy, shade, and breeze protection on your porch, gazebo, pergola, or other outdoor structures. EasyShades can even help cool the inside of your home if you install one over large windows. SunSetter Products also include high quality TopFlight Flagpoles. The Telescoping Flagpole has a patented design that businesses as well as homeowners will love. It solves the problems found with ordinary flagpoles in regards to maintenance and tangling. These are some of the finest flagpoles available on the market today. Please click a link or photo below to learn more about SunSetter's Retractable Awnings, EasyShade Window Shades, and TopFlight Flagpoles.